Take diversification to the next level with UMAX. Enjoy the benefits of the TD Ameritrade Institutional Third Party Strategist Platform and diversify by asset class and strategist. 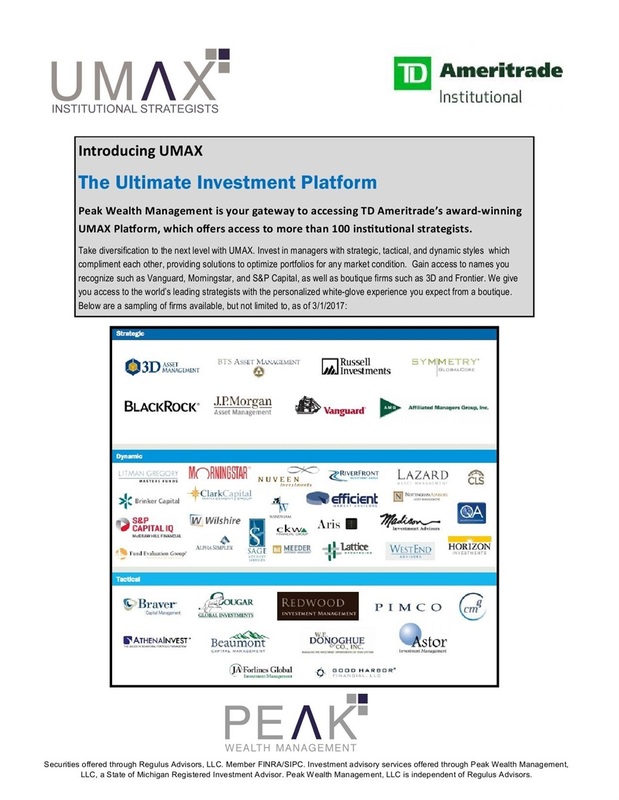 Our UMAX platform allows for low cost ETF’s, including Smart Beta ETF’s, as well as the full No Load and Institutional Fund Universe. Access strategists such as Vanguard, JP Morgan, 3D Global, Frontier, Standard and Poors, Athena Invest, PMC, and over one-hundred more. Subject to minimums, you can have exposure to unlimited strategist in your account. Diversify by investment philosophy and style, not just by asset class. Why limit yourself to just your advisor’s model? Or have access to just one of the above world-class managers when you can access them all? In order for us to tailor your portfolio and align your portfolio we need to understand your risk tolerance. With our partnership with the world's first risk alignment platform, we build portfolios that fit.